Neng Ha Young was looking straight at her grandfather, with red eyes and a blush. Neng Mu gi took in her gaze without a word. Neng Ha Young began thinking about something, then called out to her grandfather with a sad face. She took out the partially completed sequence records from her clothes. She observed it carefully for a moment, then put it down on the table. The sequence records had all the martial artists of this generation listed according to the order of power. Neng Ha Young didn’t need it anymore. Neng Ha Young stopped speaking, and looked at her grandfather. Neng Ha Young bit her lip, and stood up. She expected it to an extent, but knowing the truth truly made her feel uncomfortable. That was because she had absolute confidence that her grandfather was the strongest man in the world up till now. After seeing his granddaughter say her goodbyes and leave, Neng Mu Gi opened his mouth. The empty room. In that room, where only Neng Mu Gi was thought to be in, a second person appeared out of nowhere. The man that appeared was the Night Emperor’s only disciple, Shi Yup (視曄). He was a young man with a pale skin, and a smooth face. He appeared in front of Neng Mu Gi with a polite attitude. Neng Mu Gi looked at the young man, and spoke. Shi Yup thought for a moment. What should he say? After thinking a bit, he spoke. Perhaps that was true. The martial world was a world of men. Living in that world with a woman’s body. That in itself was extremely dangerous. If a woman didn’t have a reliable shield around her, living in the martial world would not be easy. Shi Yup quietly thought about his teacher’s words. Then he realized. His master, who seemed cold and uncaring. The only thing his master actually cared about was Neng Ha Young, his master’s granddaughter. It seemed that Neng Mu Gi, who didn’t even seem like he would bleed when stabbed, actually had some attachments to his family. While Shi Yup was thinking about such things, Neng Mu Gi opened his mouth. Neng Mu Gi’s words. It took a while for Shi Yup to process it. Once he did, his eyes shook violently. The words he didn’t expect out of his master’s mouth. When his master spoke, all his thought processes paused for a split second. And after recovering, he immediately went down on his knees and bowed towards his master. Shi Yup trembled at Neng Mu Gi’s words. No, not yet. This was too early. There was still much to learn from his master, wasn’t there? Neng Mu Gi shook his head. 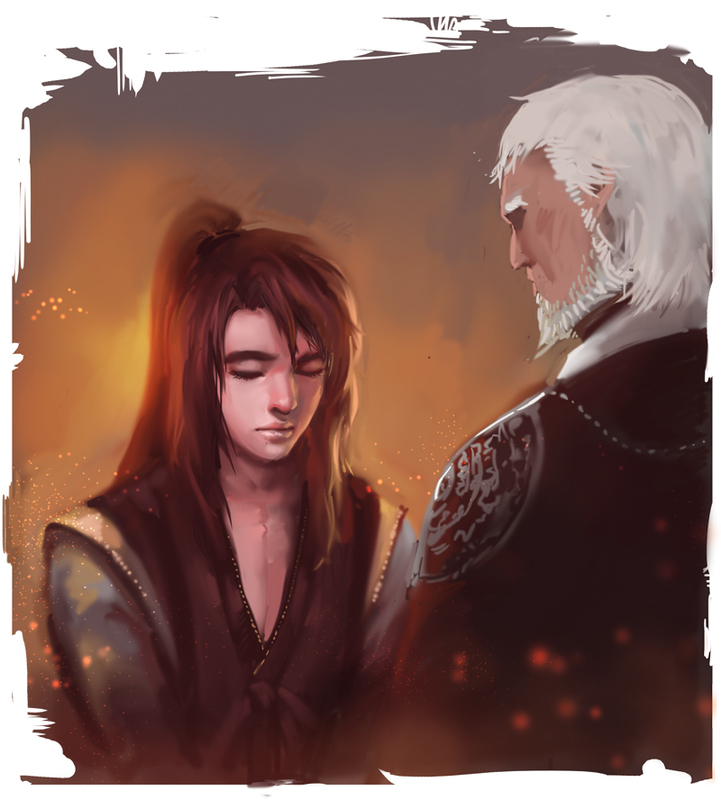 Neng Mu Gi looked at his trembling disciple with a emotionless face. That’s right. Shi Yup had forgotten how to live without orders a long time ago. Once he realized this fact, his face froze. Neng Mu Gi, seeing that, opened his mouth with a bored face. Neng Mu Gi said this, and looked out the window. Shi Yup, seeing his master’s quiet self, couldn’t approach him. He had served his master for almost 20 years. He had so much loyalty towards him, that he could kill himself if his master told him to do it. But there was something else that couldn’t be explained with loyalty. Shi Yup began thinking. And he immediately found an answer. Neng Mu Gi was his teacher and master, and at the same time, a father like figure. Others were jealous of Neng Mu Gi’s position as one of the three sovereigns, but Shi Yup knew what it was really like for Neng Mu Gi to be one of the three sovereigns. His master’s life wasn’t filled with riches and prosperity. His master actually led a desolate life, contrary to what others believed. Shi Yup never saw Neng Mu Gi laugh out of joy so far. That was why Shi Yup wanted Neng Mu Gi to become happy, at least once. The reason why Shi Yup trained day and night under his master, was to at least make his master feel a sense of accomplishment. Shi Yup had never disobeyed his master, for his master’s happiness. But not now. This was an order that he couldn’t obey. Neng Mu Gi didn’t respond. He simply looked out the window with an uncaring face. Shi Yup felt a sense of sternness from his master’s attitude. Neng Mu Gi was a man that wouldn’t back down from a decision, no matter what happened. Shi Yup, knowing that, made a desperate expression. But after thinking for a long time, Shi Yup faintly smiled. He already knew what Neng Mu Gi was truly worried about, didn’t he? Come to think of it, Shi Yup could take care of his master’s only worry himself. He felt that he could make his master truly happy by doing that. Neng Mu Gi did not reply. He simply turned around, and stared at Shi Yup. Shi Yup opened his mouth, under his master’s gaze. Shi Yup trembled a bit when Neng Mu Gi said that. What else should he call Neng Mu Gi, other than “master”? Shi Yup, after thinking a bit, thought of a word in his mind. He never dared say it before, and he never said it in the past. It was a name that Shi Yup would never get to say in his life, except in this moment. Neng Mu Gi did not say anything. But Shi Yup could tell. His teacher wanted to ask Shi Yup to do this. Neng Mu Gi looked at Shi Yup, who was leaving the area without a word. The boy was his disciple, but he never called the boy that. He had found the boy in the streets, dying, and he had imparted all his techniques to the boy, and made the boy live hidden from others. When Neng Mu Gi thought that, he faintly smiled. The boy couldn’t live without orders. That’s what worried him the most. But didn’t the boy just act and think on his own? Neng Mu Gi was satisfied at that moment. Shi Yup went on to do something he didn’t need to do, but since Neng Mu Gi knew what Shi Yup was like, he accepted his disciple’s decision. If the boy started improving himself starting now, and becomes complete, a legendary swordsman would appear in the martial world. And that swordsman will protect his granddaughter. Then, his granddaughter would be safer than anyone else in the world. Neng Mu Gi closed his eyes, and leaned back in his chair. Once he did so, he could remember the conversation he had with his granddaughter a moment ago. Fourty years ago, Neng Mu Gi had an ambition. It was something every martial artist, no, every man dreamed of. Neng Mu Gi wanted to accomplish that dream badly. So what should he do, in order to unify the world under one power? What was the most efficient method? Neng Mu Gi thought for a long time. An answer soon came to him. This was the martial world. In this world, power is law. Therefor, his dream would naturally be accomplished if he became the strongest. That wouldn’t be nearly enough. Then what else would he need? Neng Mu GI was again able to reach an answer in a short amount of time. He needed something backing him up. He needed an organization that had immense power to support him. Neng Mu Gi, after investing quite a lot of time, satisfied one of two requirements for his dream. The Three Great Powers. The Alliance, Black Moon Guild, and the Heavenly Demon Church. He became the leader of the Black Moon Guild. He no longer lacked much power. The only thing he had to do now, was to eliminate the two other rivals in the world. So he went to visit them. The first person he visited was the leader of the Alliance, the Dao Emperor, Baek Mu Ryang. It wasn’t hard to meet the man. Neng Mu Gi walked through the main gate without any disguise whatsoever, but no martial artist saw him. No, they weren’t even able to detect his presence. As long as Neng Mu Gi willed it, he could make someone right in front of him not be able to notice him. After all, he was a man that surpassed human limits. A man that surpassed the normalcy. That man, after seeing Baek Mu Ryang, put on a serious face. He was about ten steps away from Baek Mu Ryang. Neng Mu Gi had started thinking at that point. For the first time in his life, he had met a person that he wasn’t sure if he could win against. Once he went beyond ten steps to approach Baek Mu Ryang, he would have no choice but to reveal himself. He didn’t want that. That was because he had a feeling that he might lose. That was why he studied the enemy for a long time. When he did so, his conviction of victory slowly rose. At worst, he would die if he went up against the Dao Emperor. Unfortunately, it seemed the rumors about Baek Mu Ryang were true. After observing Baek Mu Ryang for half a day, he made up his mind. He decided to to meet the Demon Emperor. With that, Neng Mu Gi set off for the Ten Thousand Great Mountains (十萬大山). That was what described the Heavenly Demon Church, residing in the Ten Thousand Great Mountains. A place where no one in the martial world was allowed to enter without permission. But of course, this only applied to normal people. There was no one that could stop Neng Mu Gi from entering the church. After he climbed the mountains, he saw that man. The man who was sitting down with a lazy position, coupled with a lazy expression. It was the Demon Emperor, Gongson Chun Gi. Neng Mu Gi’s eyes changed once he saw the Pope. He only felt one emotion that moment. Disappointment. Neng Mu Gi wrinkled his eyebrows. He just came after meeting the Dao Emperor. That was why he believed some of the rumors about Gongson Chun Gi that circulated the martial world. Didn’t he come all the way here with a pretty big expectation for the man? The thing that was in front of him was nothing but a scarecrow wearing some fancy clothes. It seemed that this man simply became a sovereign because of his position. Neng Mu Gi felt disgusted when he thought that this thing was on the same rank as him. He stepped forward, determined to kill the Pope. He took another step. Neng Mu Gi slowly began walking forward to kill Gongson Chun Gi, then stopped five steps away from his target. Something was off. It was something that couldn’t be explained, some kind of strange feeling of danger. Neng Mu Gi couldn’t determine what was making his instincts tremble like so. So he stepped back, for now. He began to observe the surroundings. He thought that the feeling would soon pass. But he was dead wrong. Half a day. Neng Mu Gi just stood in place, staring at Gongson Chun Gi for half a day. That’s when Neng Mu Gi finally realized. While Neng Mu Gi was thinking about something with a serious face, Gongson Chun Gi yawned, and went to sleep on his bed. Even then, Neng Mu Gi couldn’t do anything. No, to be honest, the man was full of openings. But was it because the man had this many openings? Neng Mu Gi didn’t have the courage to attack. This kind of a weird feeling was something he had never encountered in his lifetime. And after exactly half a day had passed, Gongson Chun Gi woke up with sleepy eyes, and began to go on a walk through the garden. Neng Mu Gi, who was following the Pope, opened his mouth with a stiff face. At that time, the sun was already setting, and the sky was getting colored blood red from the sun. Gongson Chun Gi wasn’t even surprised when he heard Neng Mu Gi speak. He just made an awkward face. Once Neng Mu Gi heard this, he realized. He realized that this man in front of him was observing him from the beginning. This man was acting as if he didn’t notice, from the start. Even the Dao Emperor was unable to detect Neng Mu Gi’s technique. What all this implied was all too clear. Neng Mu Gi’s eyes began to grow cold. Gongson Chun Gi nodded. And grinned. Neng Mu Gi ground his teeth while listening to Gongson Chun Gi’s words. Indeed. Gongson Chun Gi was a martial artist. One whose power even Neng Mu Gi couldn’t fathom. But he couldn’t back down now. He had come too far to go back. The moment Neng Mu Gi stepped forward with his expressionless face. Gongson Chun Gi saw the heavens and the earth split in two. You are amazing and beautiful, thank you very much!!! Hm? Satisfied with the number of chapters read? Um, i just wanted to say, there was a typo here..’Then, her granddaughter would be safer’…it should be ‘his’ instead of ‘her’? well, for the story…oh—?! So, Gongson Chun Gi is one of the most powerful! Awesome! Also, Neng Ha Young’s relationship with her grandfather is pretty sweet! Therefor, his dream would naturally be accomplished if he became the strongest.